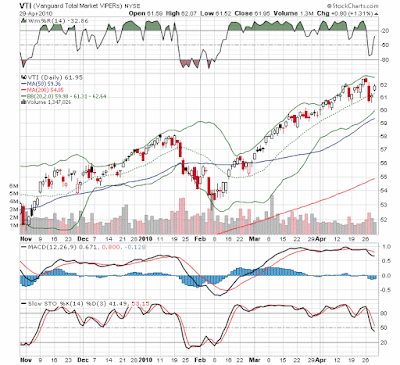 Alert HQ signals for Thursday, April 29, 2010 - surprising resurgence in stocks. Can this be real? 54 Swing Signals -- 46 BUY signals and 7 SELL Signals and one Strong BUY. 351 Trend Leaders, all in strong up-trends according to Aroon, MACD and DMI. We have 107 stocks that are new additions to the list and 130 that fell off the previous list. 10 Trend Busters of which 6 are BUY signals and 4 are SELL signals. 188 Gap Signals -- stocks with upside or downside gaps or gaps that have been closed. 80 are bearish gaps and 108 are bullish gaps. On Tuesday it looked like stocks were heading for a downturn. Subsequent news related to sovereign debt in Europe seemed to confirm the bearish stance. Mr. Market, however, had other things in mind. Here we are two days later and the market is undergoing a resurgence. Most of Tuesday's losses have been regained. Our Swing Trading Signals have swung decidedly bullish and even served up a Strong BUY today (what do you think of Finisar?) Out Trend Leaders list is mired at a pretty mediocre number of stocks but the number falling off the list has decreased significantly since Tuesday, indicating a real slowdown in bearish momentum. We also have a majority of bullish upside gaps showing on our Gap Analysis list. The oddball today is the Trend Busters list which is surprisingly small but still leaning bullish. Before we jump to any conclusions, we should do a little chart review. 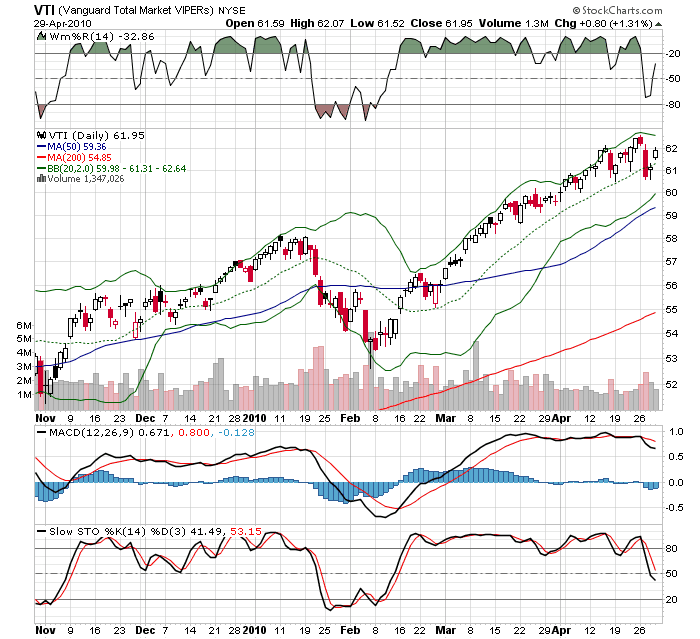 Here is our Vanguard Total Market VIPERs ETF (VTI). The gap upward is positive as is the surge back above the 20-day moving average. It is interesting to see Williams %R reversing course and moving upward again. On the other hand, we have both MACD and Slow Stochastics still in a bearish mode. The bottom line, then, is that things are still a bit shaky. Caution may be the best strategy right now. Those who have dry powder, however, should be looking for places to put it, either now or in the near future. Alert HQ, as usual, has plenty of good stocks and ETFs for your consideration.